There was an article yesterday in the local papers discussing the latest figures from the Ministry of Housing for foreigners buying property in Spain. I wrote about these figures the day before, noting that just 484 holiday homes were sold to foreign buyers in the first quarter of the year. But this article says that 5,036 were sold. Why the difference? I’ll explain, but first let’s have a look at the data from the Ministry of Housing. The following table compares sales to foreigners in the first quarter of 2008 with the first quarter of 2009. Under the heading ‘Resident in Spain’ are purchases by foreigners officially resident in Spain. 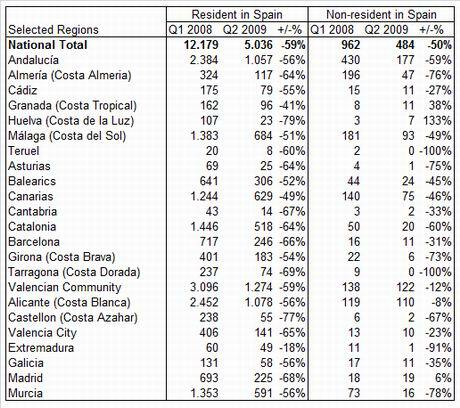 Under the heading ‘Non-resident in Spain’ are purchases by foreigners living elsewhere. To my mind, foreigners living elsewhere (484) are buying holiday homes, whilst foreigns living in Spain (5,036) are most likely buying main homes, not holiday homes. That explains the difference. Furthermore, I assume that a big chunk of foreign residents buy homes are actually economic migrants, not Britons and other Europeans relocating or retiring to Spain for the better quality of life. That said, I do accept that some or many of those 5,036 resident foreign buyers will be Britons and other Europeans buying property in Spain. Whatever the case, the data shows that sales to both groups of foreigners are down much more than the overall market, which ‘only’ fell 33% in the first quarter.